Moving over to the Greenworks 40-Volt push mower has really shown me the wonders of using electric equipment around the yard. Finding an affordable rider like the new Ryobi electric riding mower was not even in the cards it seemed. Until now. Meet the Ryobi RM480e. It’s an all electric machine that will mow up to 2 acres or 2 hours, depending on which way you want to look at it. Considering my electric push mower journey, it’s exciting to go cut the lawn now because there are no more trips to the gas station, oil changes, spark plug testing, or other common routine maintenance. Combine all of those things with the ability to start my mower with the push of a button and it’s definitely worth the cost. Think about the class of a Nissan Leaf, but for riding lawn mowers. The all-electric car runs on nothing but pure batteries, is the best-selling electric car, and boasts it’s “super quiet and efficient”. I feel like this mower will meet all of the same criteria, but will also be a best-seller. 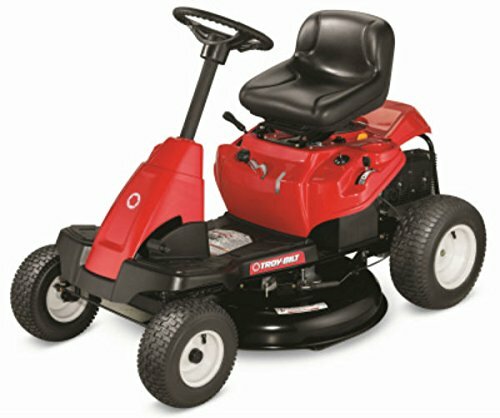 With the reputation of Ryobi and their selection of electric push mowers, this riding mower could effectively be the new, go-to electric pick for yards that aren’t huge, but require a rider to get the job done. For Ryobi, they have been in the industry for a very long time. They have really worked to get their electric tools and equipment fine-tuned and fit for an average consumer. That being said, it’s nothing new that this mower uses no gas and has zero carbon emissions. One of the reasons an electric riding lawn mower has become a reality is because of lighting technology. If the mower batteries have to power two 30-watt bulbs, it [obviously] takes away from the energy source. You’ll get less mowing time because power has to go to the bulbs. However, with LED lighting, you’ll have the longevity of the low-energy bulbs as well as remaining power. Since the Ryobi riding mower doesn’t use gas power, the noise is significantly cut down. Plus, an added benefit is that the only heat being created is from the batteries, not from a combustible engine. There are 3 brushless motors that run the blades and drivetrain of the mower, so you’ll be getting a longer lifespan from the motors themselves. A distinct advantage of a brushless motor is that there are no brushes to wear out. That advantage in turn creates low maintenance of the brushes. There is a high initial cost for these types of motors, but the benefits outweigh that cost. If Ryobi decided to use brush motors, the disadvantage would likely be more electric noise and have a much shorter lifespan on the motor and overall the mower itself. One aspect that’s really fascinating about what Ryobi did for this equipment was add safety features that don’t normally exist on a typical riding mower. One of those being a beep reminder for your parking brake. That way, a reminder will be given if you happen to be on a hill or in an area where you may have thought you set the brake. 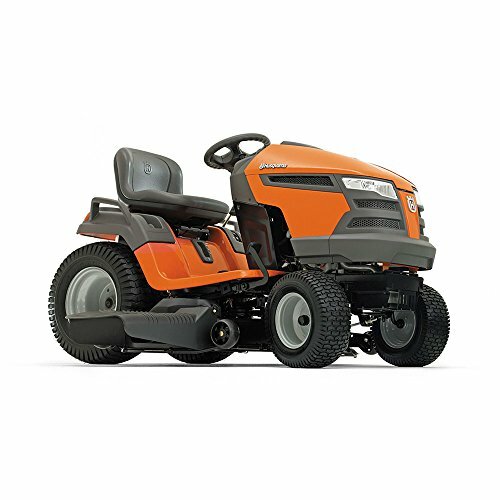 For those out there that have experience with a riding mower, you are probably aware of an operator presence control system that is usually in place to shut off the riding mower blades within three seconds. There’s actually a safety standard implemented by the CPSC (Consumer Product Safety Commission) that suggests manufacturers to stop the blade(s) of the mower if the operator does not disengage the drive. Unfortunately, this standard is not required, but merely recommended. It’s really an option that should be a requirement for any riding lawn mower. Keep an eye out for a label on the machine stating it meets the ANSI/OPEI B71.1-2003 standard for safety. This is pretty self explanatory, but if you leave the key in the ignition when leaving the seat of the mower — a nice, friendly reminder toner will remind you to take the key with you. Except for the people out in the country that leave the key in all the time, this will be helpful. In addition to the ANSI B71.1-2003 standard was a safety feature labeled NMIR (No Mow In Reverse). This states that the blades will not continue to rotate once the riding mower is shifted into reverse. The Ryobi RM480e implements a reminder about reverse driving. I hate to mention it, but many riding mower accidents happen from reverse incidents. Set this and the mower won’t move. Pretty simple. When is the last time you (or someone you knew) rode on a riding lawn mower with a smartphone charging option? It comes standard on this mower. Such a great feature; although I do wonder how much time your phone charging capabilities will take away from your mowing time frame. One of the features that definitely stood out to me was that this thing offers cruise control! Yep, that’s right. You can drive it like a car. Tie the cruise control feature in with a cup holder and it’s a sweet right through the yard, cold drink on board and tight turns. It Comes With Lithium-Ion Batteries, Right? One of the greatest technologies right now that is accelerating rapidly is lithium-ion batteries. And, while many of us are used to having them in our smartphones, power tools, and other pieces of tech, they aren’t quite compatible with what an electric rider needs to operate. The type of batteries Ryobi decided to use are lead acid. Inside the mower are four 75Ah 12V batteries (hence the 48-Volt total). After they are depleted, you’ll have to wait about 10-12 hours for recharge on a typical 120V outlet. Plus, regular lithium-ion batteries aren’t air breathing batteries anyway. For the same reasons of moving to an electric string trimmer, an electric riding mower is no different. You get all of the benefits from using electricity instead of gas and super low maintenance. That means no belts, no spark plugs, and no filters! Who doesn’t get excited about that? With a 3-year warranty, if the minimal routine maintenance does not cover a problem, it will be repaired or replaced without charge for parts and labor by an authorized service center for RYOBI. As the owner of the equipment, shipping costs (if needed) will have to be paid by you. What Are Ryobi’s Electric Mower’s Specs? With 12 positions to adjust for the deck, there are plenty of options to make your lawn down to less than 2″ (1 1/2″ min.) or if you have a longer cut, the deck can be raised. Options still exist for your preference of how to contain the grass clippings. If you do want a bag, you’ll have to purchase a similar bag like this one separately. A comparable gas model to the Ryobi RM480e has an 18″ turning radius. A smaller turn radius means tighter corners. With a 16″ radius, that means making turns more efficiently around the yard. Precision cut steel blades help with cleaner cuts and longer sharpness. The deck is also made of reinforced steel to protect it from bumps, trees, and other collisions. The deck is also weather resistant to withstand things like moisture and grass buildup. The below models are the closest comparison with the Ryobi RM480e because of the differences with deck width and the form factor. As you can see, the pricing does vary with each model, and although the Ryobi is a bigger upfront investment, you’ll gain dividends on not worrying about regular maintenance that comes with a gas riding mower. 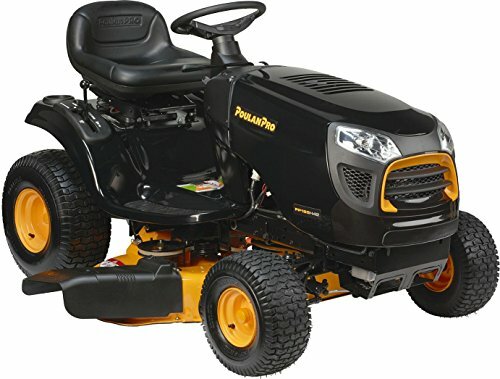 Husqvarna 18.5 HP Variable Transmission Pedal Tractor Mower, 42"
Poulan Pro 15.5 HP Automatic Riding Mower, 42"
Where is the Ryobi RM480e Electric Mower Available? As the time of this article, the electric riding mower is exclusively available at Home Depot. It’s possible that more vendors will eventually get the RM480e model, but not certain. This is similar to the Greenworks 60V lineup only being available at Lowes. With Home Depot’s 30 Day Return Policy, if you’re in the market for a new mower, this is a winner. With other electric mowers coming into view, Ryobi will have to set the standard to continue providing the best electric equipment for the average consumer. You can find the mower at Home Depot and they’ll be on/off sites like Ebay in the future. We’ve reached to Ryobi Marketing to hopefully get our hands on a demo of the riding mower or even some of their new lineup of power tools. Don’t forget to download Adobe Reader to view PDFs on a desktop. If you’re in need of clearing walkways, sidewalks, or driveways, then this is going to be perfect. You’ll have the opportunity to get all the way down to the pavement and move snow up to 30 feet! It seems like this is a bit more fun than shoveling snow. Another cool feature about this electric snow blower is that you can hang it on a wall if you’re looking to save some space (or don’t have the space to spare) with it’s low weight. Some of the more detailed specifications include a 13-amp electric motor, a steel auger that boasts rubber tips for durability, and the ability to clear a space of up to 18 inches wide/10 inches deep. There’s an oversized chute that will rotate 180 degrees in case you need to shoot the snow in the opposite direction. This also makes it easier to move around when you’re using those [easyazon_link identifier=”B00Z8MGQI0″ locale=”US” nw=”y” nf=”y” tag=”lawnaholic-20″]heavy winter gloves[/easyazon_link]. *Important to note: the Worx WG650 does not come with a power cable. It must be purchased separately. You don’t have to worry about power with this beast! You can make your job much easier and get even more done with the benefit of a more powerful motor. The Snow Joe SJ623E comes with a 15-amp motor versus a 13-amp motor giving you even more power to push the snow in front of you. Another great benefit of this Snow Joe is that you’ll have the ability to see much better since it comes with a halogen light for those early morning snow drifts. The bulb itself is 20 watts. It’s got a our blade rotor that is made of heavy-grade steel to force its way right through about 10 inches of snow. Near the bottom of the electric blower there’s a scraper blade that clears and scrapes the snow with no damage to your sidewalk or area you’re working in. This model is perfect for using in mid-to-larger size areas including driveways, patio areas and sidewalks. You’ll be able to throw snow about 25 feet versus the Worx competition. I’m a big fan of the Greenworks brand given that you can use all of their equipment with the use of their batteries that come with some of their tools. However, for this model — the Greenworks 2600502 snow thrower — it is corded. This may provide to be a benefit in some way due to the fact that you will virtually never run out of juice! I’m assuming that you’ve paid your electric bill! But, in case you want to see the other options offered, have a look at some of the features. You’ll still be getting a 13-amp motor which works very similar as a gas alternative. For many of the snow blowers, they have an 18″ clearing width, and for this you’ll be able to clear up to a 20″ path. Hey, two inches can make a long-term difference! It’s a more compact design to help for storing when the thrower is not in use and also runs with a quieter motor. You’ll be happy if you decide to start throwing snow at 6am so you don’t have to worry about waking the neighbors. This Greenworks model also offers the advantage of the 180 degree directional chute to allow rotating to throw snow in the opposite direction. There’s a 10″ clearing depth (again, a two inch difference) that is more than some of the other models. If you don’t care about the cord, you’ll benefit from this model and it can clear more of a path than the other competitors. Moving to an electric society is really upon us. There are many pieces of equipment that now have the power of gas and are true alternatives to helping the earth. Snow blowers are no exception. There will continue to be even more electric tools for us to use and whether it’s winter, spring, summer, or fall, hopefully we embrace the new age of technology. If you’re really big about saving time and want a clean looking driveway, patio, or even sidewalk, an electric snow blower is going to be your best bet. You can save the strenuous back exercises and clear your drive. This is especially helpful if you get a lot of snow and have to return back to clear the area every hour or two. I hope you found value in this review!